Note: Although this bundle is specifically configured to support F5&apos;s APM (single sign-on) functionality, the included triggers can be modified as needed to support other applications which utilize session cookies. This bundle is meant to provide a framework to map session cookies in general to usernames, which are identified during authentication. Out of the box, ExtraHop does a great job of showing metrics for HTTP clients by IP address. However, it is sometimes useful for organizations to track activity based on username rather than client IP. The challenge is that the username is typically only seen during the authentication process. A successful authentication will likely result in the client being issued a "session cookie" through a "Set-Cookie" directive. This session cookie is submitted by the client&apos;s web browser on subsequent transactions to identify the user and authorize the transactions. The ExtraHop system is able to capture the authentication request and associate the resulting session cookie back the the username for the life of the cookie through it&apos;s unique, event-based triggers and ability to access the HTTP payload. Some organizations utilize F5&apos;s Access Policy Manager (APM) to handle front-end authentication for their applications. This bundle provides the triggers necessary to capture the authentication attempt to the F5 APM and associate the resulting session cookie (MRHSession) to a username. 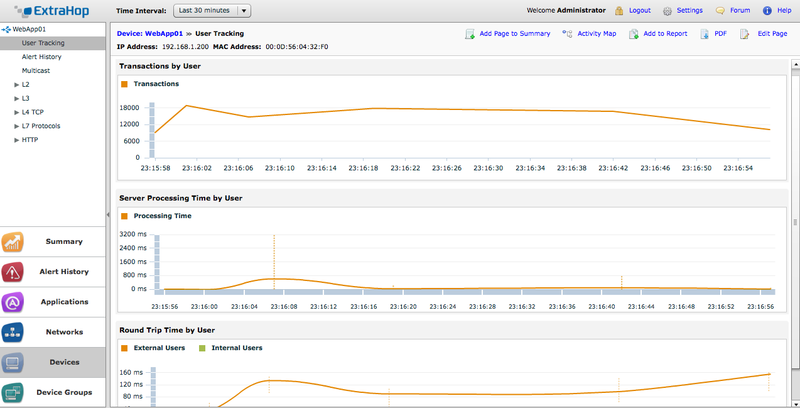 This provides the ability to report on top users based on transaction count as well as server processing time (load). Likewise, network round trip time is also recorded per-user. This also provides the ability to keep an audit log of users&apos; activity for applications which may not support natively. This will decode the escaped unicode value to the actual character. ExtraHop firmware 3.7 and newer. HTTP traffic must be unencrypted. ExtraHop appliance must be equipped with SSL decryption and certificate key imported to ExtraHop. Apply the resulting ExtraHop User Tracking F5 APM Bundle in the bundle detail page. Assign triggers and custom page to appropriate devices to capture authentication and HTTP transactions. This is most likely the virtual server (VIP) of the web application.